Walking distance from all restaurants, theaters, and shopping, 503 conejo ct in Danville is the perfect location for the perfect evening stroll. Enjoy 3 bedrooms and 2.5 baths with stunning high ceilings in family room and master, with updates from top to bottom. The Brand new cabinets, countertops and backsplash highlight the kitchens new layout for a bigger and more spacious feel. The genuine custom bamboo floors and stone fireplace steals the show, with the patio setting the stage in the back yard. 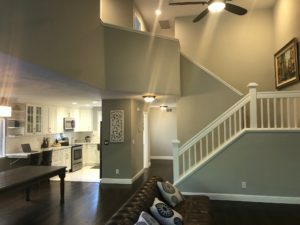 The upstairs features brand new carpets and remodeled bathrooms with custom tile work in both the master shower and guest bath alongside new vanities, and tile flooring. With new decorative fans and lighting setting the tone, this will be the perfect place to settle down in and enjoy.